On September 15, the heavy rain came early in the morning. KABC-TV reported: “In downtown Los Angeles, 2.39 inches of rain fell, breaking the previous record of 0.03 inches set in 1968…. The large amount of rainfall received in downtown Los Angeles made Tuesday the second-wettest day in September since 1877.” It was a very wet day in what otherwise was a very dry year to date. It would also be a very distinctive day for the LAPD Reserve Corps. A vortex of sorts was in the works with three meetings — two next door to each other that morning, and one later that evening. The Los Angeles Police Commission was to hear the results of the Inspector General’s report on the LAPD Reserve Corps. The Commission had tasked the IG with determining whether what had happened in Oklahoma on April 2 — when a 73-year-old Tulsa County sheriff’s reserve deputy mistook his firearm for his Taser and fatally shot a man — could possibly happen in Los Angeles. Police Commission meetings are usually held every Tuesday, in an auditorium on the first floor of PAB. Recently, these meetings have become rather lively with protestors and their public comments. Under Personnel statistics, the Chief’s report included 391 Levels I, II and III reserve officers; 372 specialist volunteers; and 61 chaplains. Also at this meeting, the newest member of the Police Commission, Matthew M. Johnson, was elected President of the Commission. The details of the meeting below are not so much chronological as an attempt to summarize the main points in a clear, concise way. To ensure that the reporting is precise, The Rotator quotes from the meeting transcript. 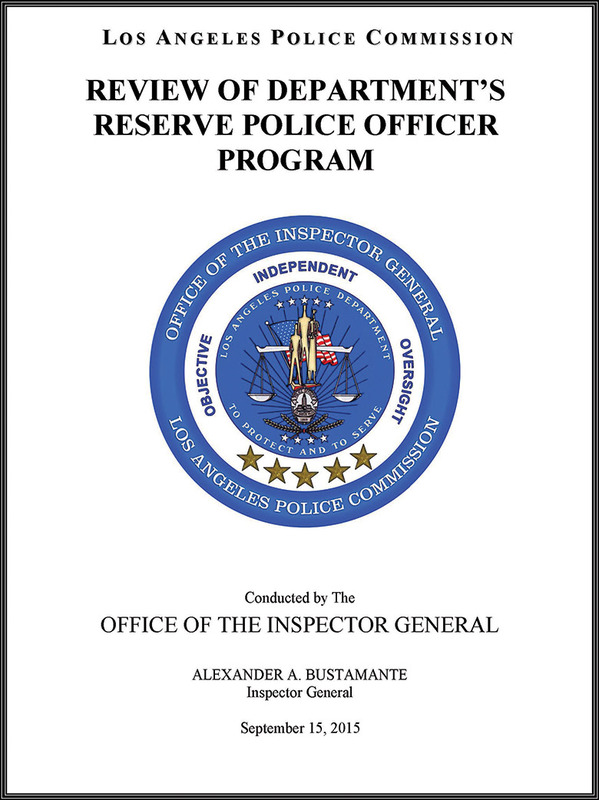 The IG report on the LAPD reserve program (available at www.lapdpolicecom.lacity.org/091515/BPC_15-0283.pdf) focused on service, training and deployment issues. It found that some officers had not fulfilled minimum service and training hours, or had failed to qualify. But it also found that there were no reserve OISs or other Categorical Uses of Force between January 2013 and March 2015. And it discussed “age-related deployment,” in answer to the question about Oklahoma. In conclusion, the IG report made several recommendations based on the findings (see sidebar). The report was published on the Friday before the Commission meeting. The Los Angeles Times posted an article on the same day with the headline: “LAPD watchdog raises concerns over training and oversight of reserve officers.” The Times article focused on the “age-related deployment,” highlighting the ages of a couple of officers working in Patrol. 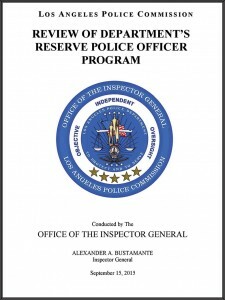 In the meeting, Inspector General Alexander Bustamante clarified the purpose of the report, saying that it was not a criticism of the reserve program itself: “This report had nothing to do about whether or not reserves are important or essential to the Department, whether they work hard, whether they are meaningful with their impact in the Department or any of those things…. We think reserves are a fantastic part of LAPD and an essential one. That had nothing to do with the report…. The report was simply about: Are there better ways to ensure that the people that are in reserve capacity do what they’re required to do, have the training that they’re required to have?” Mr. Bustamante also clarified the issue of “age-related deployment.” He said the goal was to find “an age-neutral way” to ensure that officers are physically capable of Patrol functions. Review of Department’s Reserve Police Officer Program: Deputy Chief William Murphy led the Department’s presentation to the Commission. He was joined by Commander Patrick Smith and Lieutenant Darnell Davenport. At one point, Chief Murphy said that it was comparing “apples and oranges” to equate the LAPD reserve program with the one in Tulsa County. For training, the report found that 31 officers each completed less than 10 CPT hours for a recent two-year period. The Commission was informed about the Department’s auditing efforts, and that reserve officers (Levels I and II) are held to the same standard in terms of CPT and perishable skills training. A 10-hour use-of-force class is currently being planned, and reserve officers may be directed to attend it. The course would include six hours of perishable skills. Deputy Chief Murphy reminded the Commission that a lot of Department training is career-path-related; for example, reserve officers do not go to lieutenant or sergeant training. “Age-Related” Deployment: The Department position was that age by itself must not be the determining factor. Deputy Chief Murphy told the commissioners: “They want to be police officers. If they can do the job, then that’s the key. I’d be uncomfortable with putting an age on something if they can do the job; if they can do those essential job functions.” One of the older reserves working Patrol, it was noted, was a retired full-time sergeant with many years of service. Firearms Qualification: The report discussed the matter of FTQs, and the IG’s specific recommendation was that reserve officers with 30 or more years of service should have to qualify more than once a year with their primary firearm. Assistant Inspector General Kevin Rogan, whose office was responsible for the report, made his case for having reserves (with 30 years or more of service) qualify more: “I can understand, and we agree that the reserves provide a great service to the City. And we certainly want to give them the impression that they’re valued members.” But he said they are “different” in that they don’t work as much, and thus are not as “familiar” with their firearms, or as practiced with tactics and other daily police procedures. Reserve Motors: Commissioner Robert Saltzman asked for information on the Reserve Motors, inquiring why only West Traffic Division had a unit. In the end, the Commission voted to table a decision on the IG recommendations until the Department presented its follow-up regarding the firearms qualification and other training questions. Meanwhile, across the hall, reserve coordinators from throughout the Department met with the Reserve and Youth Education Section (formerly named Reserve Officer Volunteer Unit) in the COMSAT Room. The meeting served as an introduction to the program for those new to the position, as well as getting into the details of current issues and coordinator duties and procedures. New recruitment plans were described, which can be read in more detail in the cover story of this issue of The Rotator. Assistant Chief Moore provided a command perspective on the Reserve Corps. Much of the September 15 meeting was a debriefing of the Commission meeting and a summary of the Coordinators’ meeting. Chief Moore emphasized the comments made by Chief Beck and the command staff at the Commission meeting, which should leave no doubt of the Department’s position and its support of the reserve program. Lieutenant Davenport updated the Committee on pending items. Recruitment and increasing the size of the Reserve Corps topped the agenda, and the lieutenant and his team have begun to implement this. The new reserve recruit class started in September, with 14 LAPD recruits (four of which were from the POPPs program). A much larger class is being planned for July 2016. Officers will be able to go through the modules at a much faster rate. A goal is to provide more in-service training opportunities for all reserve levels, based upon reserve input. This includes a 12-month calendar that identifies training opportunities. The lieutenant mentioned that a lateral hiring and training process was approximately 90% complete. Administratively, the notice for the new stipend procedure has been completed. This will change the stipends to being paid once a year, as previously reported. A single messaging system for reserve officers, like Nixle, is being looked at. The next Committee meeting was scheduled for November 17. There is a three-year maximum term for those appointed to the Committee. The current membership will be posted on the Chief’s Web page under “Divisions and Sections” and under “Reserves.” Suggestions can be submitted directly to committee members or via the Reserve and Youth Education Section, which will also contact the Committee members with suggestions. The reserve officer members of the inaugural Committee are Sharon Abbott, John Colello, David Cox, Mitchell Englander, Mel Kennedy, James Lombardi, Eric Rose, Michael Sellars, Randi Tahara and Drew Terenzini.